Yesterday would have been your 101st birthday. Everyone seems to have a Julia story. Mine is about a trip to Hollywood in 2009 to see Julie & Julia, which culminated in meeting Julie Powell, who had sparked my interest in your story two years earlier when I read her book. Whenever I'm in a horrible funk, from which even the gooiest of mac-n-cheeses won't rescue me, I turn to you. I watch old episodes of The French Chef. I browse your cookbook. Sometimes, I even spend an evening making one of your recipes. In fact, my first post on this blog was about one of your dishes: Potage Parmentier (Leek & Potato Soup). In the last six years, whenever I felt bored or uninspired or was drowning in anxiety or self-pity, I often cooked a French dish and thought of you. You reinvented yourself at age 37 when you enrolled in Le Cordon Bleu. This alone inspires me. Your passion for living, your excitement about--well--everything, reminds me to focus on the good parts of my life. I wish I had known you. 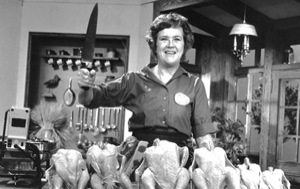 But I am grateful to be able to learn about you through your cookbooks, your memoir, and your television shows. Thank you, Julia, for the legacy you left us. Bon Appetit! In a 3-4 quart stock pot, simmer the potatoes & leeks in the chicken broth, partially covered, for 40-50 minutes or until the vegetables are tender. 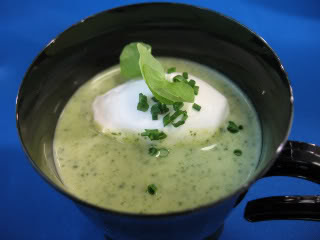 When there is 5 minutes of cooking time left, add the watercress to the simmering soup. Puree the soup in batches in a blender. Remove to a tureen, bowl, or another stockpot. Stir in the cream and season with salt & pepper to taste. Serve the soup garnished with minced chives, if desired.